Yesterday installation of seats began at Turner Stadium, as it is now called. 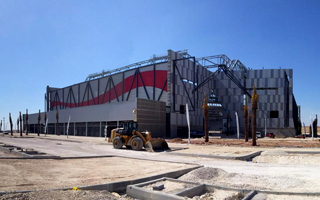 New Be’er Sheva stadium will be available for tours soon as it prepares to open this summer. After interventions by Hapoel supporters red is the colour of seats currently being installed throughout Turner Stadium. Approximately 16,000 will eventually be delivered, with first couple hundred already in place. Most seats installed in Be’er Sheva come from Germany and are of the popular foldable FCB model. Meanwhile premium seating was ordered in the US and will be arriving on site soon. Currently construction is nearly complete. All structural elements are in place, facilities only need furnishings to welcome fans in the 2015/16 season. One thing still missing is the turf. Cleaning works are ongoing across the site as supporters are invited to sign in for guided tours already in June, before official delivery of the stadium. The new stadium, financed primarily thanks to the national lottery, will bear the name of Yaakov Turner, former mayor of Be’er Sheva.